In construction, railways, highways, hydropower and coal mines and other construction, concrete construction in many infrastructure construction occupies a considerable proportion. 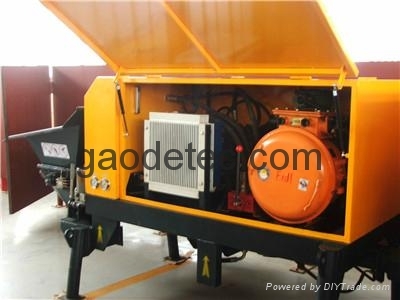 Concrete machinery is a very important construction machinery. Mini coal mine concrete pump is a construction equipment for the transportation and pouring of concrete. small coal mine concrete pump can continuously carry out horizontal conveying and vertical conveying at one time, high efficiency and reduced labor intensity, especially for high-level or long-distance complex terrain concrete transportation. Gaode coal mine concrete pump supplier learn from the world's advanced technology, combined with numerous applications to improve the experience, fully meet the modern construction of high efficiency, low consumption requirements. The hydraulic system adopts the double pump double circuit, the pumping unit adopts the imported high pressure large displacement variable oil pump, the distribution unit adopts the S pipe valve form, the product is widely used in the urban construction, road and bridge construction, water conservancy and hydropower, tunnel Construction and other construction sites.